We made it to Friday friends!! I am ready for a super relaxing weekend filled with Whole30 meal prep and reading my latest book, Big Little Lies. I read another book by the author a couple years ago, The Husband’s Secret, and finished in like 2 days it was so good. I have been waiting for this weekend to start reading, so that I could really get into it without distraction. I ordered this top not 100% sure how I felt about the print online. I figured in person it was either going to look a little cheap or be gorgeous. Ya’ll when it came in the mail, I was so happy to see it was the gorgeous option. 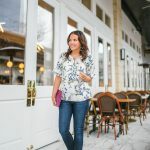 It has the prettiest romantic spring feel from the print to the color choices. 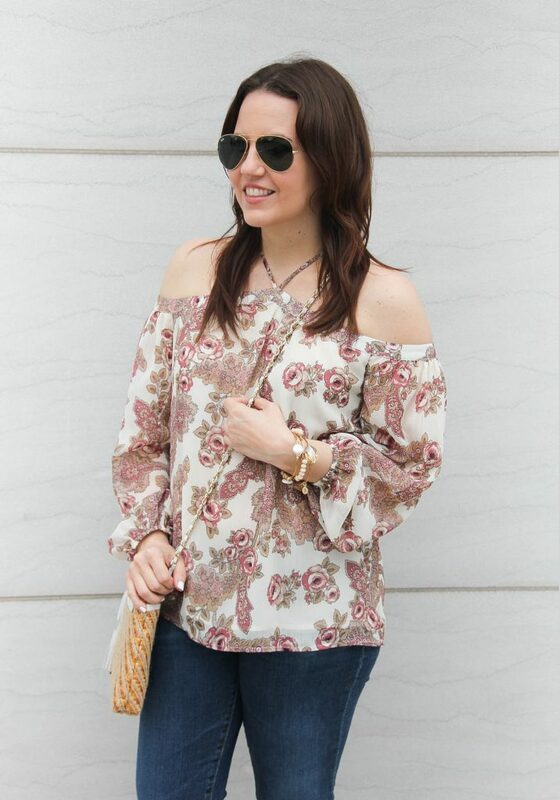 I love this halter/cold shoulder design, because I think it can be flattering on an array of body types. I can picture it paired with white jeans or even a pair of white jeans shorts during the summer. You can also swap out my sandals for wedges to make the look more casual. Another item giving me all the spring and summer feels is this beautiful bag. 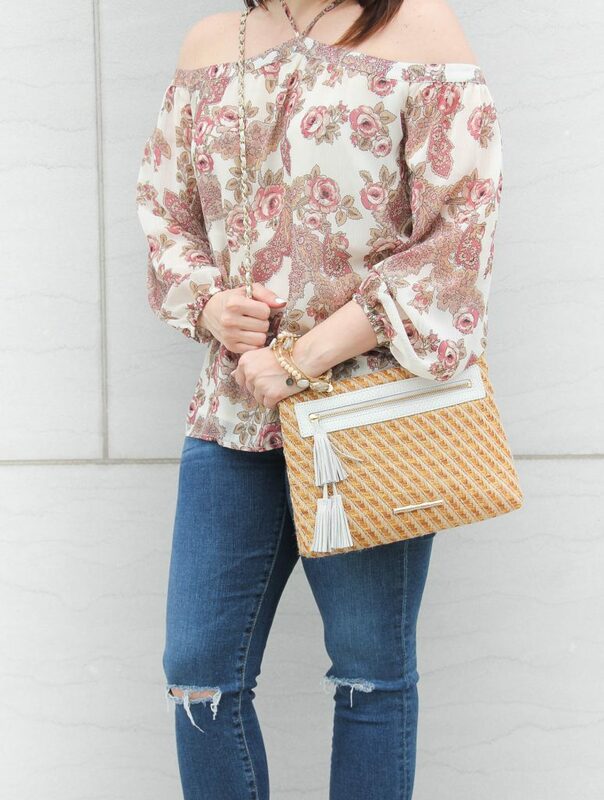 I really wanted a neutral bag to work with all the fun colors and prints of the season, but something with a little spark for days when I wear neutrals or all black. You know when you are looking for something, but can’t put a good enough description on it to tell someone. You’re just going to know it when you see it, that is this bag for me. 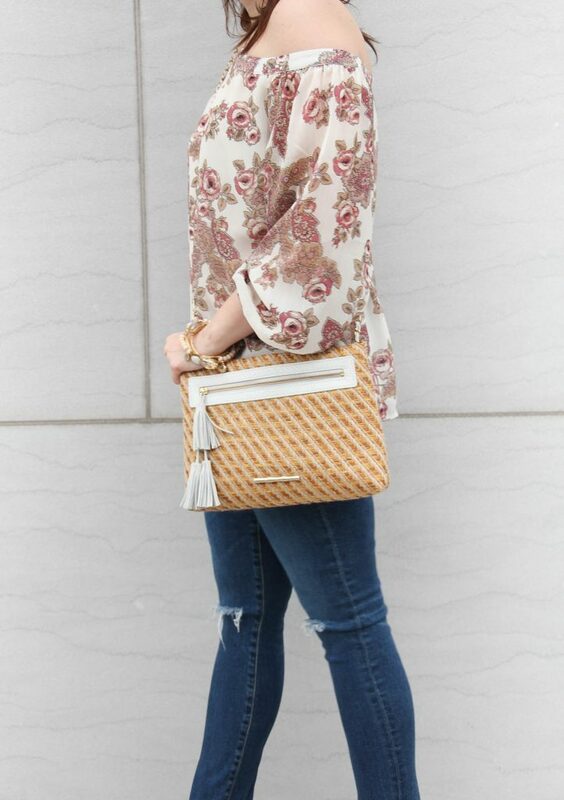 The bag is by Elaine Turner who is one of my favorite clutch designers, and she totally upped her clutch game by making the perfect clutch/crossbody hybrid with this bag. I tuck the strap into the back pocket of the purse when I want the clutch look for a party or happy hour. When I need my hands to hold champagne, play on my phone, or do a little shopping, the strap comes quickly back out. I also have to give props that the strap really fits in with the design of the bag and wasn’t just some quick add on. It’s like you have two bags and both are equally fabulous. Alright I will stop gushing over my new bag, I really am quite obsessed with it though. Don’t forget the times changes this weekend. I’m never a fan of losing an hour in a day, but I will gladly take it for the longer daylight hours that follow!!! 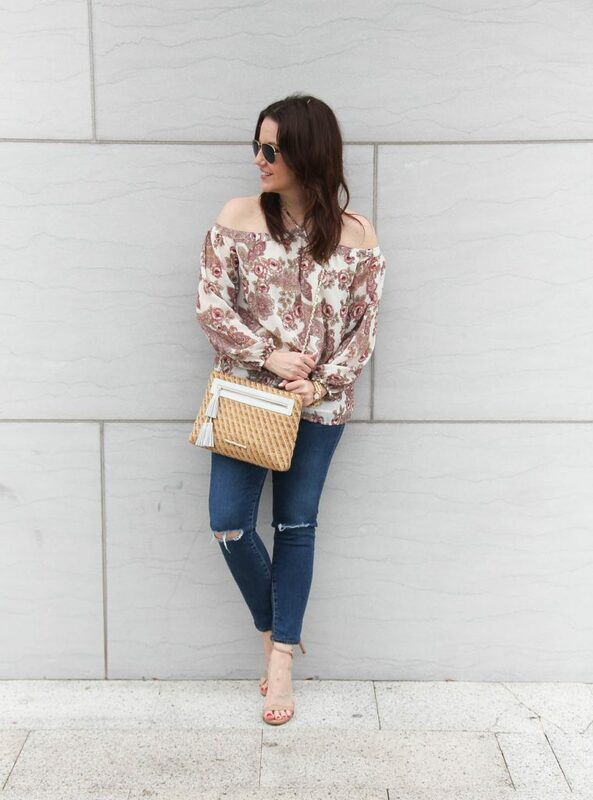 Ya’ll have a really good weekend, and I will have more spring must haves for your next week. See you then! Such a cute everyday look! 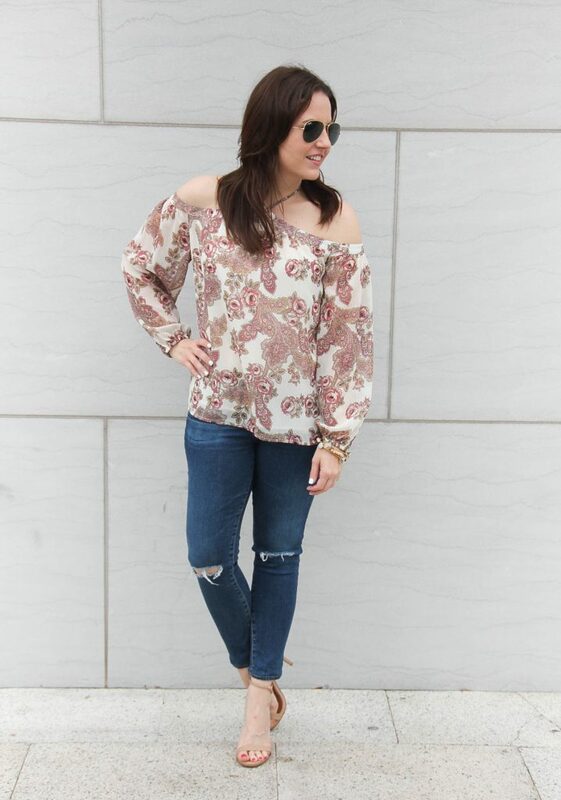 Love the floral top. Love the OTS top!! Pretty floral print! Such a cute shirt!!! Love it! I love that this top ties around your neck! You look great in this top! Love your shoes! And I know this time change is getting the best of me right now! I love this top! 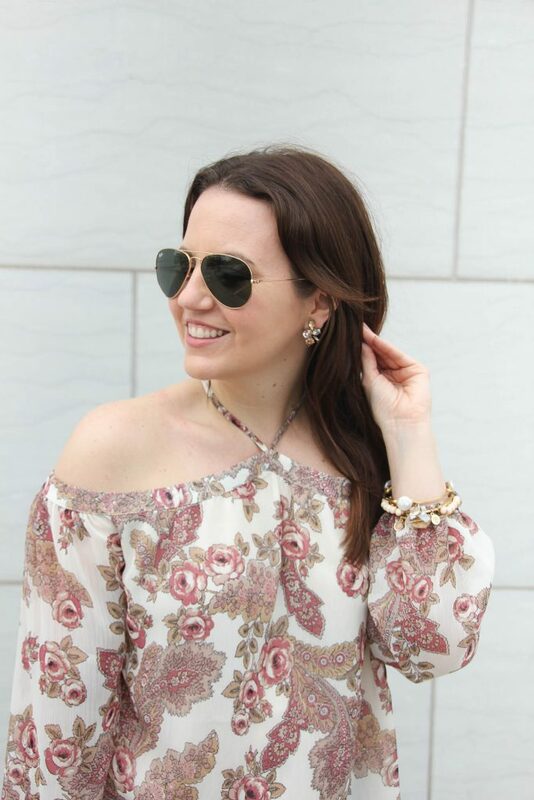 The off the shoulder with the little halter tie is so cute. I love the print! Love a bag like that! Have a great weekend! I love bags that can serve multiple functions and yours is perfect. A new clutch is on my wish list as well. 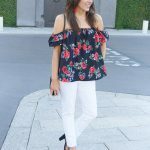 Ahh love this top – I tried it on but had three others that I wanted more so I didn’t get it but it looks so fabulous on you!! Loving that bag as well! Prints can be so tricky to order online because you’re never sure exactly how something will look in person. 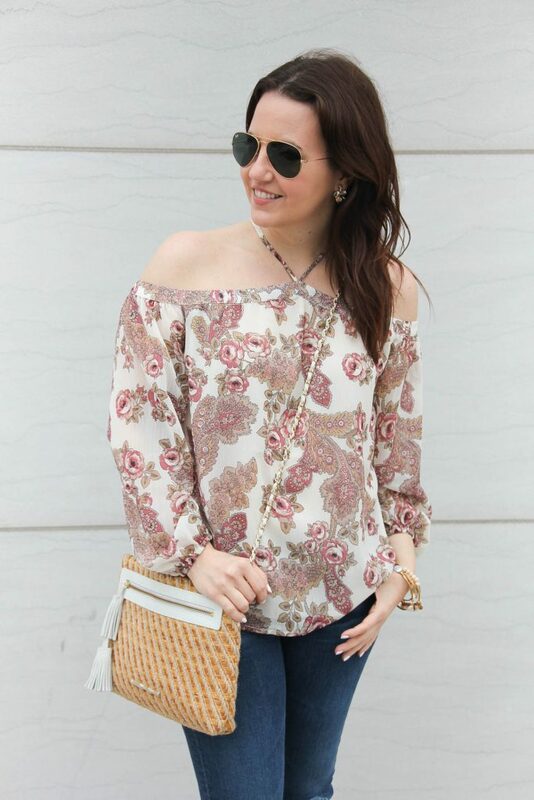 Love the neckline and the billowy sleeves.